Listen to the show here, and subscribe in iTunes for FREE! A long and winding show across the universe of Mac Topics. John Blagden joins the G-Men and gives us quite a lesson on what Mac Pros want from their hardware, ESPECIALLY the now-canceled XServe. Gaz seeks and finds some help for his MacBook and Guy has grown to hate his current iMac for NOT running GarageBand properly. 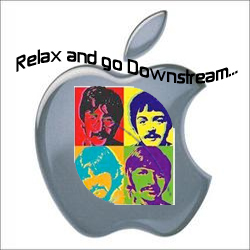 The Beatles are now on iTunes and after all this time, how big a deal is it really? Contact info: Want to be on the show as a listener invite? It’s more fun than tanks and helicopters!! Drop us a line and let us know you want to be on the show. Gaz and Guy on Twitter,guy@mymac.com and gaz@mymac.com, feedback@mymac.com, or our Skype direct number 703-436-9501. Also go into iTunes and leave some feedback.